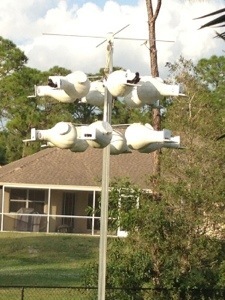 And So Purple Martin Season Begins! Yesterday was the official start to our purple Martin season for 2014. The first purple Martin for the season was reported in Jupiter on December 30th but January 12 was our lucky day. Today I count 3 ASY males and 1 female going in and out of gourds and the males are singing happily on the rack. I find this semi out of character as they usually are very quiet the first week or so. I almost wonder if they have been here but perhaps I did not notice them. 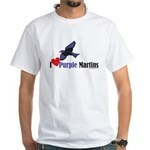 It is possible since we have been über busy here at PurpleMartins-R-Us.com. Our annual price changes, new products, and after Christmas rush has been keeping things busy. One of our new to us products is the entire line of CUENT (Creative Universe) gourd racks including the K series 24 racks and the Gemini racks. Also new is Free Shipping on ALL martin houses, gourds, and gourd racks. How Australia Deals With Invasive Birds! Wow, there is no denying it. 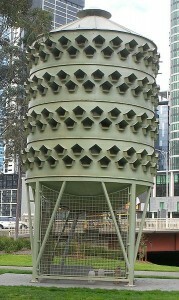 Approve or disapprove, Melbourne Australia has a “No-Holds Barred” approach to dealing with invasive/pest birds. This Pigeon Dummy Egg Nest works by encouraging the birds to lay eggs in the structure. Then at night, when the pigeons are asleep a worker access the nests to replace fertilized eggs with dummy eggs. The real eggs are promptly made into omelets. It is reported that there is a similar program in New York City, but I wasn’t able to find a pic of that one. In purple martin news, as of Dec 30, 2013, purple martins have arrived in Florida!